Welcome to ThingPulse.com. In our shop you can buy the products formerly distributed under the Squix brand. While the Squix Blog will continue to exist you will find everything of interest about the former Squix products on this page. Find out more in the About section. The 2.9″ ESPaper Plus Kit can run on the internal 600mAh LiPo battery for several weeks before it needs to be recharged. 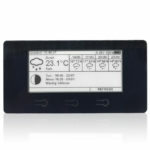 The ESP8266 micro controller only wakes up from deep sleep to download new data over WiFi and to refresh the 2.9″ e-ink screen (296×128 pixels). The ESP8266 WeatherStation Classic is the best way to get started with Arduino, ESP8266 and IoT. This starter kit contains everything to get your hands dirty and make your first steps with programming embedded devices. The comprehensive PDF guide explains on more than 45 pages how to setup the development environment, how to connect to components and also gives you ideas how to continue from there to implement your own projects. Are you into soldering? Then the ESP8266 ColorWeather Station is for you. 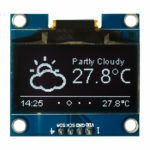 The included custom PCB lets you connect the color TFT display (320×200 pixels) to a ESP8266 Wemos Pro Mini to have everything neatly connected. The provided open sourced MiniGrafx library lets you draw beautiful animations on the color screen. There are sample applications for a plane spotter which can display airplanes on a map and a beautiful weather station included.